Open innovation takes many forms. One of the great things about working at the coal-face of this new industry is watching it develop and mature. We are starting to see a new language develop and new methods for innovating with others. One of the under-appreciated aspects of open innovation is how flexible the business model can be. Companies new to OI tend to react defensively at first: “How can we protect our Intellectual Property”? This IP protectionism in not really necessary. The picture above shows a range of range of progressively open business models with all sorts of approaches that include and transcend IP. We begin with traditional in-house Research and Development and open out all the way to a commons model. We group models into four main categories – Closed, Cooperative, Collaborative and Co-Creative. You can see featured some of the new interesting new approaches that are arising like Idea Management platforms (Cooperative) in many large firms such as Orange’s IDClic. We include Digital Platforms (Collaborative) like the Apple Appstore and Open Source (Co-creative) such as espoused by Mozilla. Have a look at the spiral and decide where your organisation is today. Where do you want it to be? The drive towards more open business models is happening because we are increasingly able to tap into smart people and great ideas from anywhere. It is also being driven by the competitive landscape changing rapidly. New business models have to reflect this agility and become more networked. Please let us have your comments and builds. There is room for debate on where we’ve placed the models relative to each other and I am sure you can think of more. How is open innovation an industry? How is Apple’s Appstore ‘collaborative’? 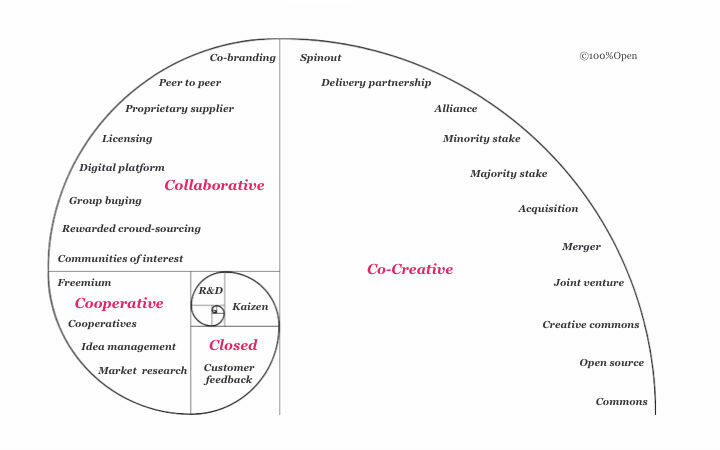 Why does your graphic assume that mergers (or most of the other business models listed as ‘co-creative’ are always closer to ‘open’ than ‘closed’? This is a superb diagram of the open business model. The Customer Feedback could be moved cl to the cooperate section though!? With OI the “our” in “How can we protect our Intellectual Property”?, is the co-operating parties, the group. For virtually everything other than patenable ideas the group can be as open as they like. No damage done. Handling the realtionships around patentable ideas in a non-Open confidential way is crucial of the collaborators are going to secure maximum value. In this area IP protectionism is necessary. Ownership of that IP is a different matter. As you go to more “open” realtionships in your diagram there are many that require this careful approach to handling patentable ideas. In OI in many instances the only thing a party is bringing to the table is IP. So it is natural that they will be protective of this. Once disclosed and on the table it’s gone. The real issue is not how to protect or avoid IP but how to manage the IP issues. That’s where the locker comes in. Can’t see an easy way of getting away from the locker. Where does that sit in the diagram? Thanks Nick. Good point about ‘our’ IP. Many partnerships start creating new IP the moment they start talking. I agree that IP needs to be managed – after all there is still IP in creative commons it’s just less restrictive. The point we were trying to make here is that IP protection isn’t the same as IP protectionism. Many OI relationships falter because they focus too much on who owns what and too little on who will do what and how fast. You’ve given me a very interesting thought – the type of IP might change as you go around the spiral too. From hard IP in the middle (patents and trade secrets) to progressively softer (trademarks, copyright,, design rights etc) as you go round. I’ve recently started teaching on an Innovation & Entrepreneurship BA and was reminded of how much the old sets of value and mindsets towards IP are embedded in the culture of design and creative education. Your spiral is a great visualisation tool for me to start introducing different ways of thinking to them. Thanks R & D ! Wingates – Thanks for the suggestion. Can you give us an example? Is there such a thing as a free lunch? Hi Tanarat thanks for your question. Yes Open Ideo is a kind of digital platform that, as far as I understand it, holds out no promise of a further exchange of value. Digital platforms can be the start of all sorts of collaborative journeys but most crowdsourcing sites (like Dell ideastorm and mystarbucks idea) are only about ideas not execution.